As the map above shows, Germany’s famous Autobahns are some of the only roads in the world without a speed limit. However, there are two other places where drivers can drive as quickly as they’d like. The Stuart Highway, in Australia’s Northern Territory, has one 200km long section between Alice Springs and Barrow Creek with an open speed limit. The Isle of Man also has no speed limits but unlike Germany and Australia lacks motorways (highways). 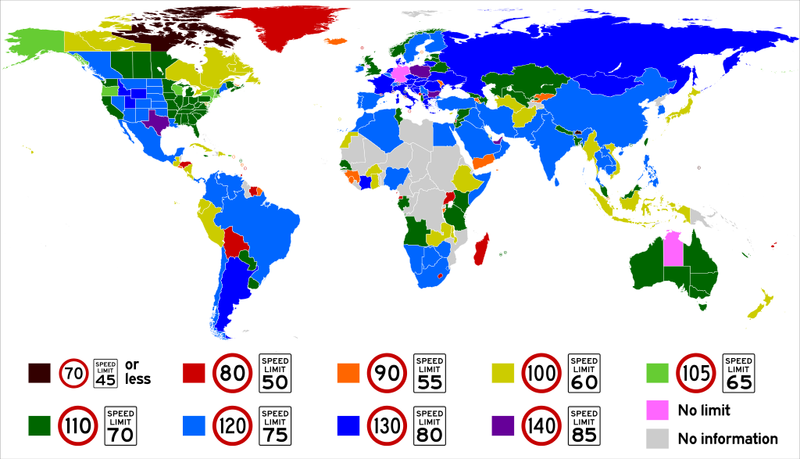 Other countries and territories impose speed limits that can vary quite widely. And remember we’re talking about the highest posted speed limit in each country, not the average. Always be sure to know and understand the speed limit where you’re driving and stick to it. Speeding kills! Surprisingly, given America’s love of cars, all states have speed limits. Until, 1999 Montana had a non-numeric “reasonable and prudent” speed limit, but this was deemed too vague by the Montana Supreme Court and a new limit of 75 mph (120 km/h) was imposed. That means a 41 mile (65km) long portion Texas State Highway 130 is the fastest road in the United States (and the Americas), with a posted speed limit of 85 mph (140 km/h). Also interesting, all US states have limits above 55 mph (90 km/h), which was the federally mandated limit from 1973-87. The limit then increased to 65 mph (105 km/h) until 1995, when it was finally abolished. Hawaii, at 60 mph (100 km/h), is only state with a speed limit below 65 mph. Alaska, Connecticut, Delaware, Maryland, Massachusetts, New Jersey, New York, Rhode Island, Vermont, and Wisconsin have all kept it at 65 mph, with all other states now having higher limits on at least some roads. Canada’s most populous provinces have even lower speed limits, with both Ontario and Quebec sharing a maximum limit of just 100 km/h (60 mph). However, it’s Nunavut with no speed limits above 70 km/h that is the lowest in Canada and potentially the world. In Europe, The UK is among the slowest states with maximum limits of just 70 mph (110 km/h). Poland and Bulgaria, on the other hand, are among the fastest with limits of up to 140 km/h. Finally, some of the slowest countries in the world include: Bolivia, Faroe Islands, Greenland, Honduras, Lesotho, Liechtenstein, Malta, Macau, Madagascar, Montenegro, Suriname, Trinidad & Tobago, Uganda all of which share national speed limits of just 80 km/h (50 mph). Nice map with only one tiny flaw. We have ea speed limit in germany on our “Autobahn” and it is 130km/h. There are only some spots where is no limit but you have to watch out for them. And even if you are lucky to drive on a part that has no limit and you are involved in a crash your insurance will tell you that it would have been better driving 130km/h. Actually, he said it’s the highest posted spot in each country, not the average. Since there are some spots where there is no limit, that makes it the highest. This map is wrong. Idaho, Montana, Utah, and Wyoming all have 80mph speed limits on some of their rural interstate highways. South Dakota just recently increased its speed limit to 80 MPH. In Norway there are only a few motorways in the east of the country where there is a 110kph speed limit the general limit is 80kph. Idaho and Utah have an 80mph limit on rural freeways. Speed does not kill. This is a lie perpetuated by people who observe the 6 o’clock news vs observing statistics. Germany and Austria (with a combination of speed controlled and unlimited speed sections of motorway) consistently have lower fatality rates than many Western countries, e.g. the US and Canada (where I live). Not necessarily scientific, but I have driven in all the above countries, and my experience is that many many drivers are simply unable to safely operate a modern vehicle at highway speeds, either due to fear, lack of ability, lack of training, or simple lack of ability. If we keep giving drivers licence’s to people who cannot drive at speed, we will keep killing people unnecessarily….and blaming it on speed. I remember this. “Nunavut ain’t havin’ none of it.” If only they were pronounced the same. I saw this map in so many sites. But it has major errors. Speed limit shown for UAE is wrong. The highest speed limit in UAE is 160 km/h. That is for two major highway stretch between Al Wathba- Al Ain & Mafraq – Al Gweifat. In New Zealand, apart from a few short motorways the speed limit is 100 kph. Not 110 kph.